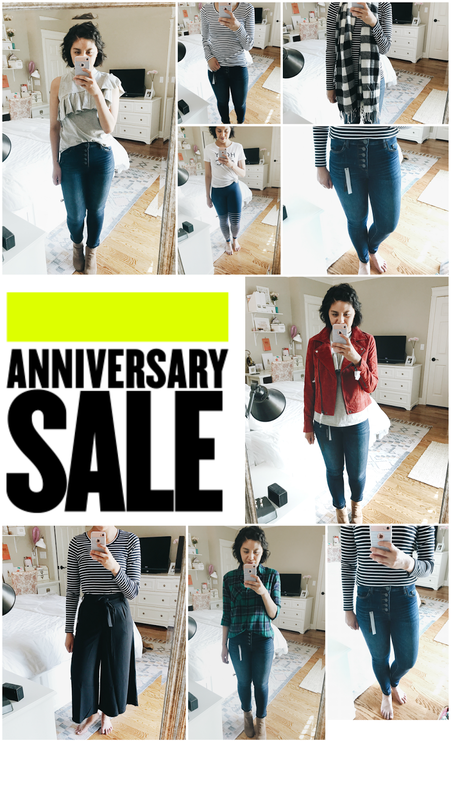 I finally have most of my stuff from the Nordstrom Anniversary Sale! I’m actually still waiting for a couple things because they were back ordered. I’m waiting for my black faux-leather moto jacket ($64.90) and brown suede moto jacket. But it doesn’t matter because they were a steal and I don’t need to wear them now. 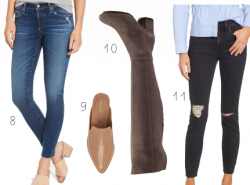 I use this sale to take advantage of the Fall pieces. For now, I will continue to wear my summer clothes. Not worth sweating in the heat so I decided to take the classic mirror selfie. I’m wearing size 27 and it fits perfect. I normally wear size 2 or 27 so these jeans fit true to size. 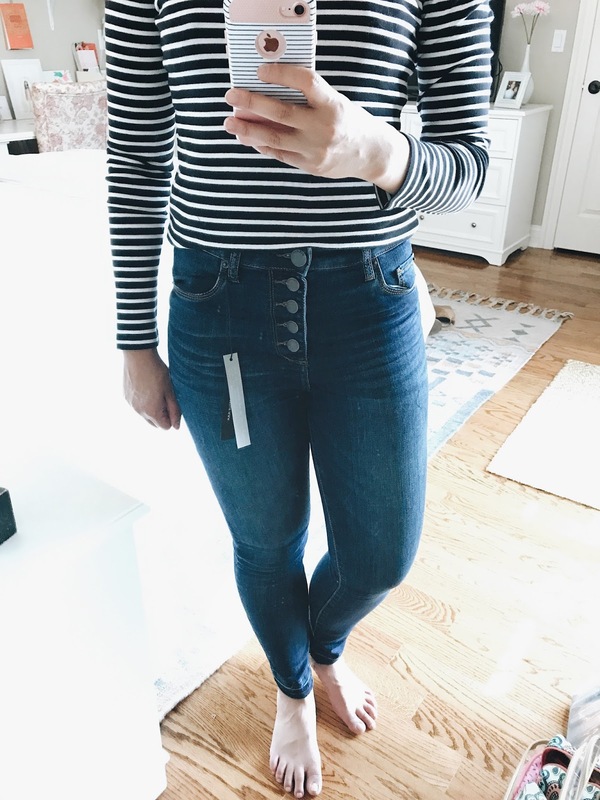 I typically purchase high waisted jeans and these jeans are definitely high waisted and fit comfortably. 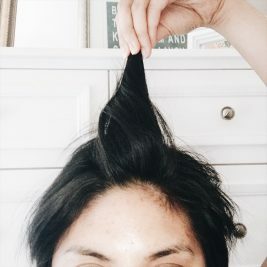 The length is just right. Not too long and not too short. I am 5’4″ for reference. I was actually looking for a more cropped style jeans. However, this worked out because I usually find skinny jeans too long and the petites are too short. So this length happens to be what I’ve been looking for, for all my jeans. 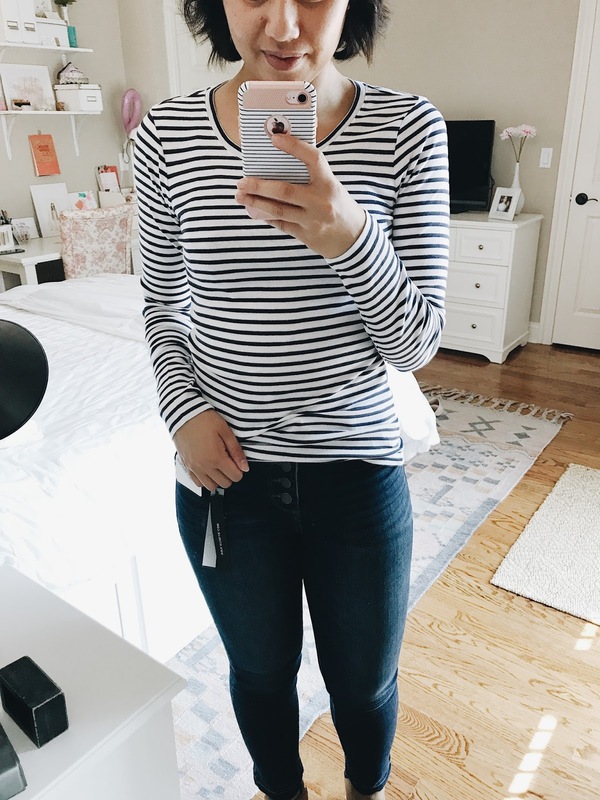 I am also wearing these jeans in all of these photos so you can see how it can be styled. I love the asymmetrical style and the ruffle details. It makes this top unique, but still very versatile to wear. I normally wear a size small in tops and I purchased a size small. I definitely think an XS would fit better, but the small gives it room to do a front-tuck if you love to wear your tops that way. Since it is cotton, I assume it would shrink a little in the wash. If you’re wondering if the long sleeve tees are the same just in different colors, you are correct. Some of my existing striped tees are worn out. I just love wearing stripes! So I decided it is time to replenish them. I purchased these tees in size small and they’re a perfect fit. The description says they run small and to size up, but I normally wear a size small and this fits well with a little room. I love the length too. It hits right at the hips. So I got it in black & white stripes and navy & white stripes. 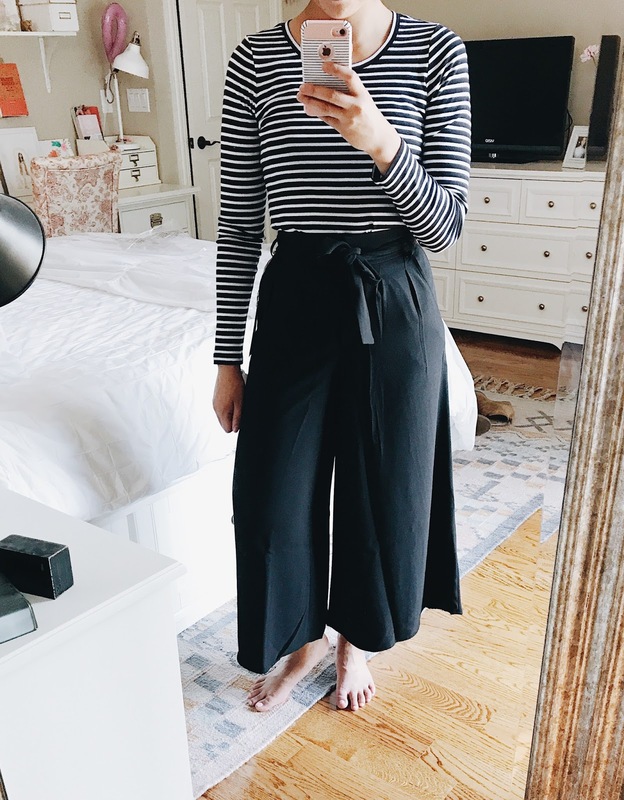 I am a sucker for wide leg pants! These pants are super wide leg that if I had my feet together, it would have looked like a midi skirt. Hence, why I’m posing awkwardly. I want to show that I’m wearing pants and not a skirt haha! I purchased an XS and to be honest, I’m exchanging for a Small. Usually, I have to size down in high waisted pants, but this time it was snug. So it is a keeper, just need to size up. I’ve been wanting a suede moto jacket for a couple years now. First time they came out, I was hesitant, and then last year I wanted to make the purchase and they immediately sold out. So this time around, I finally got it! I’m wearing the one in red. It’s not as vibrant. It is more of a burnt red, which I think is more complimentary. I also got it in brown because that is the original one I wanted. The brown is currently back ordered so it won’t arrive until mid-August. I ordered a size S and it fits perfectly. There’s still room to wear a light sweater, but it still has a nice fitted style. I usually don’t like roomy moto jackets because they don’t look flattering anymore. In this case, it is roomy and flattering. I couldn’t resist purchasing a scarf. After all, wearing scarves is what makes Fall exciting. I love buffalo plaid so a buffalo plaid scarf was a need haha! In case it is sold out, the Houndstooth Square Scarf ($18.90), Plaid Blanket Wrap ($29.90), and Plaid Blanket Scarf ($29.90) are good options too! I have a decent amount of blanket scarves, so I didn’t need a new one. 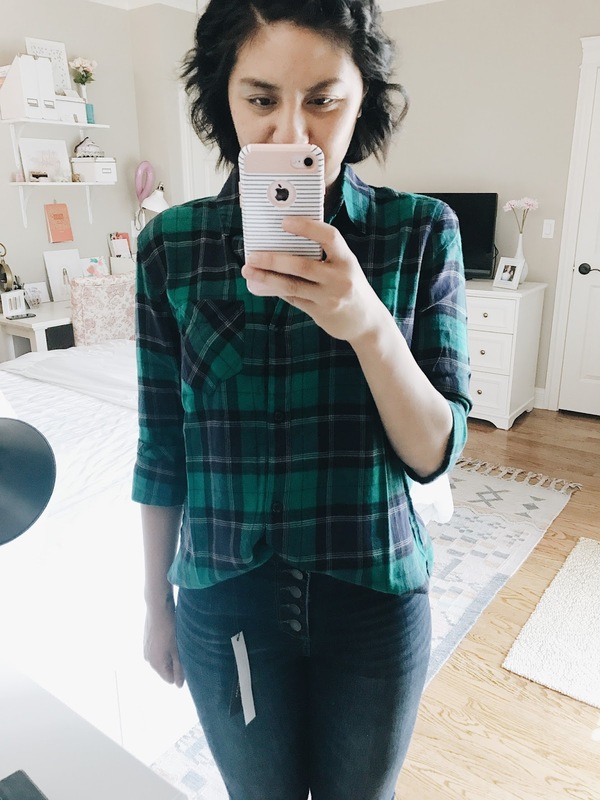 I am obsessed with this plaid shirt. I didn’t think I would love it this much until I got it. I love its tunic length, it feels soooo soft, and it’s lightweight. I love lightweight plaid shirts because I can easily layer with them. 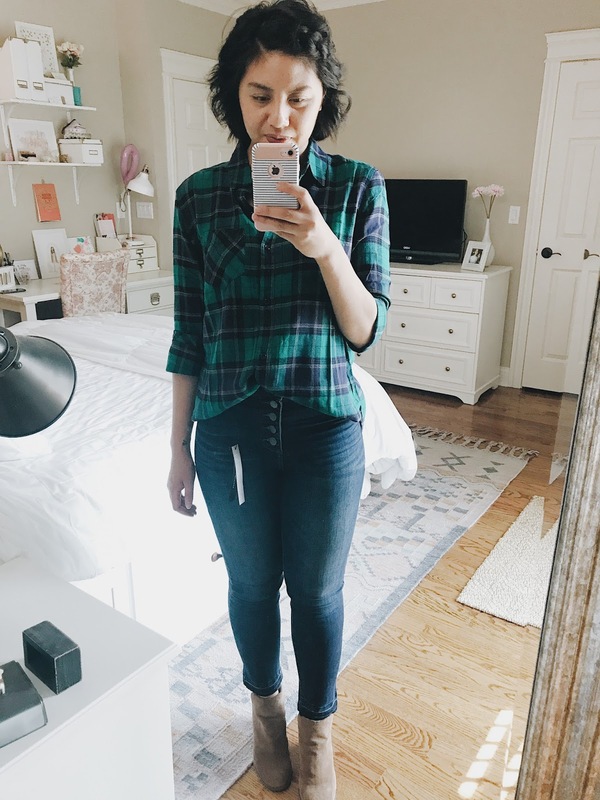 The tunic length is perfect because I love doing the front tuck with my plaid shirts. I purchased an XS and the size is perfect with room to give. It has that boyfriend style fit. I’m highly considering replacing the rest of my plaid shirts if the BP brand comes out with more plaid colors. I know I purchased these booties last year, but just wanted to share and show you guys how making a purchase from this sale is so worth it because you’ll have items that will be wearable year after year. So if you loved how my booties looked in this outfit, I figured why not share this year’s wedged booties. 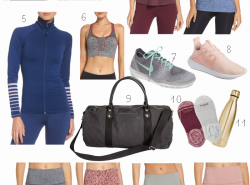 I love to purchase workout clothes during the sale and I try to get at least one workout item. I was planning to get more, but they all got picked over and now they’re all back in stock (go figure). I am wearing a size small and it fits comfortably. I really love that I can wear them for a long run or for yoga. 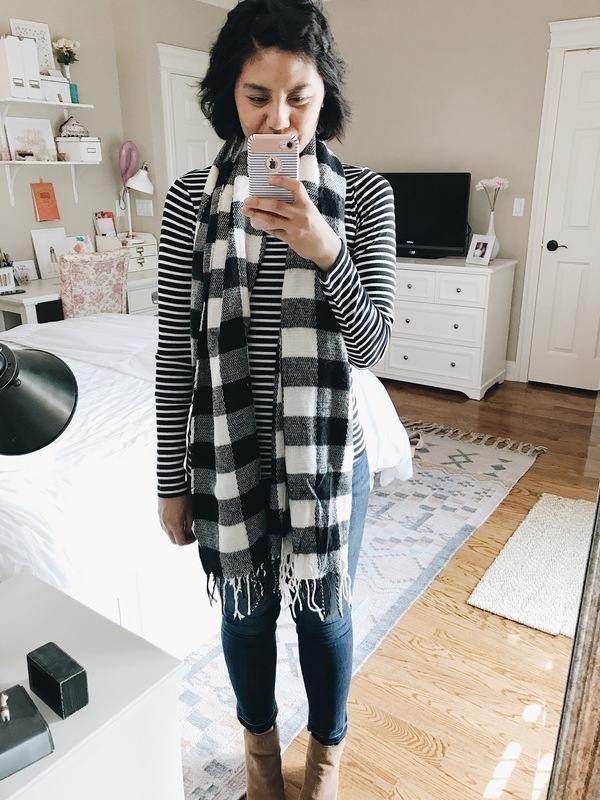 Last year, I purchased 2 of these Zella leggings and loved them! If you noticed, I didn’t get much stuff. Every year I purchase things from this sale that I think are classic and will keep for awhile. Which makes my life easier because that means every year I don’t need to purchase as much. I’m all about purchasing high quality, basic and classic pieces. They always stay in style, they keep for awhile, and are versatile. You got some great stuff! 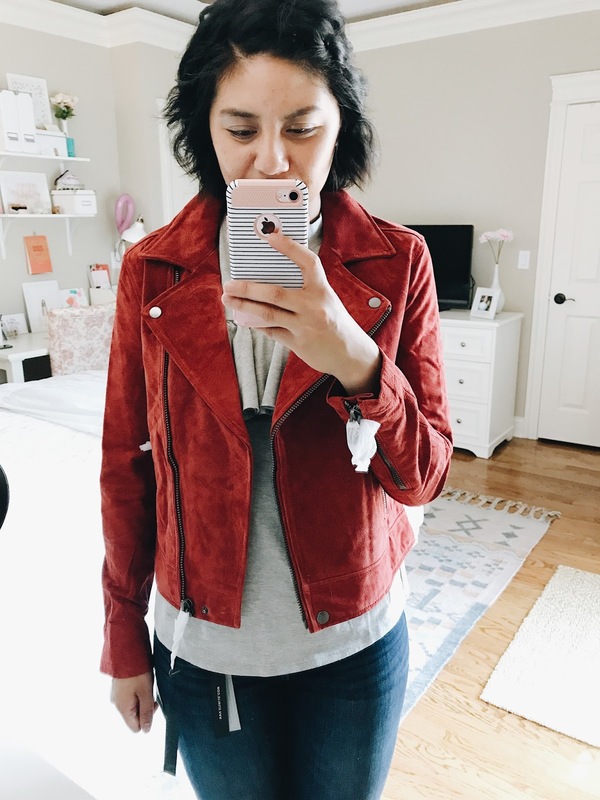 Love that suede moto jacket. So cute! I am loving all the items you picked up! OBSESSSSED with the moto jacket!!! The red color is so beautiful! Moto LOVE!! I have a couple pieces from last year that are clear favorites and I will wear them a lot this year. Great staple pieces! Right?! Yes, love buying pieces that last for years! You found some great items! Love that red moto jacket! I'm obsessed with that moto jacket! I love the booties. 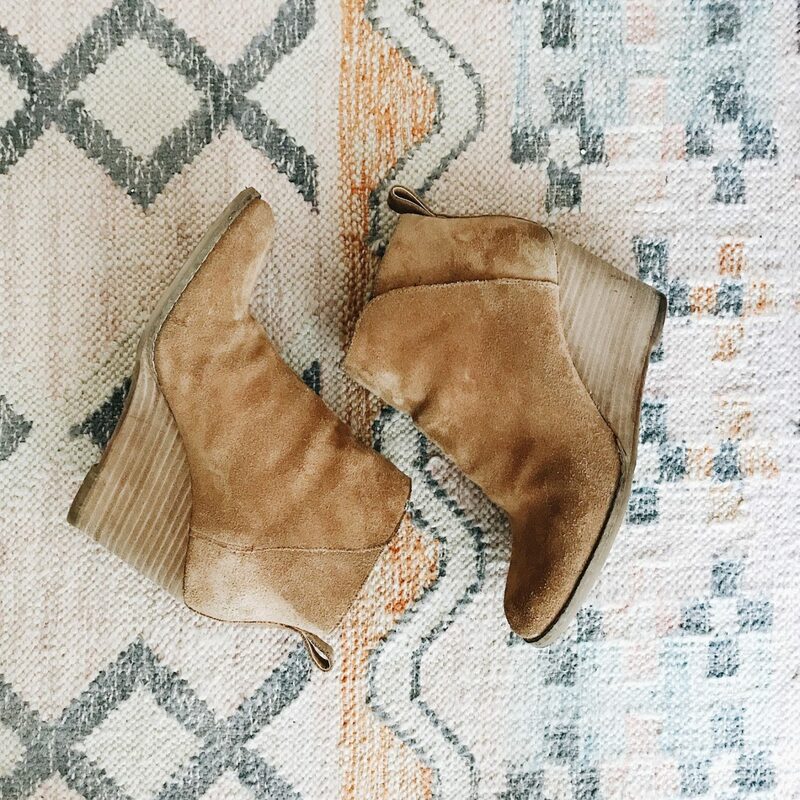 I wish I could wear suede booties, but I can't in Egypt, it will be ruined withing seconds, maybe when I finish college and move back to the USA, I will finally do it. Oh no! 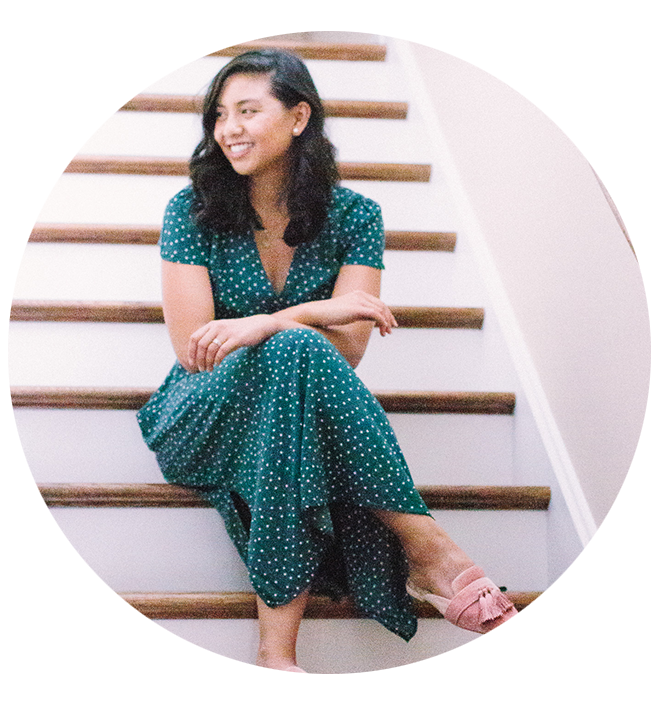 Will peep-toe booties work there? FABULOUS PICKS and you look freakin amazing in all that Norsdtrom Anniversay sale!!! LOVE THEM ALL! Stay fabulous darling! Thanks Ellese! I know, I can't wait to wear it! You got some cool stuff babe, I love it! You scored some chic and lovely ensemble, especially the suede jacket. Amazing! So many cute options Rach! Love the styles you picked out! Especially those high-waisted jeans! Thank you so much Mara! I can't believe it was only $45! You picked amazing things girl, I love what you got! I love all the beautiful items you got from the anniversary sale! 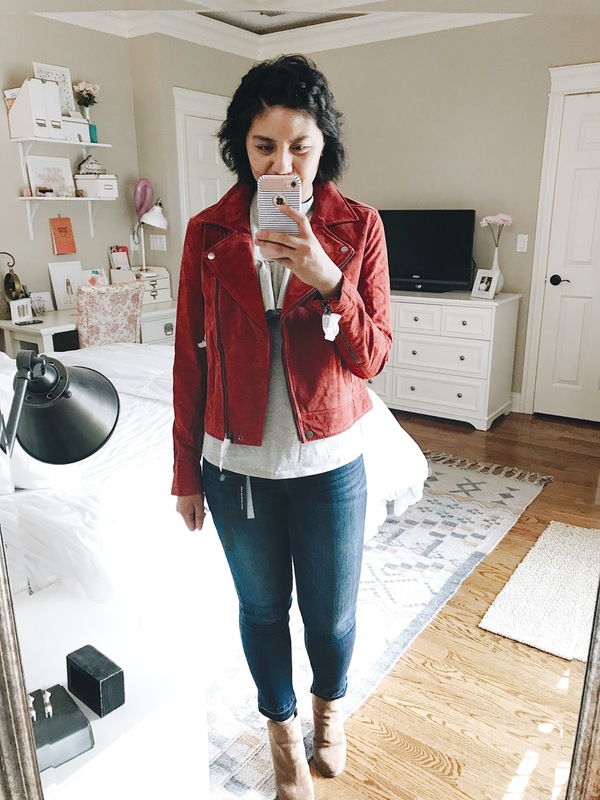 That suede moto jacket is amazing, and I love the ruffled tee…very unique! I was definitely excited for the moto jacket! Thanks Valerie! 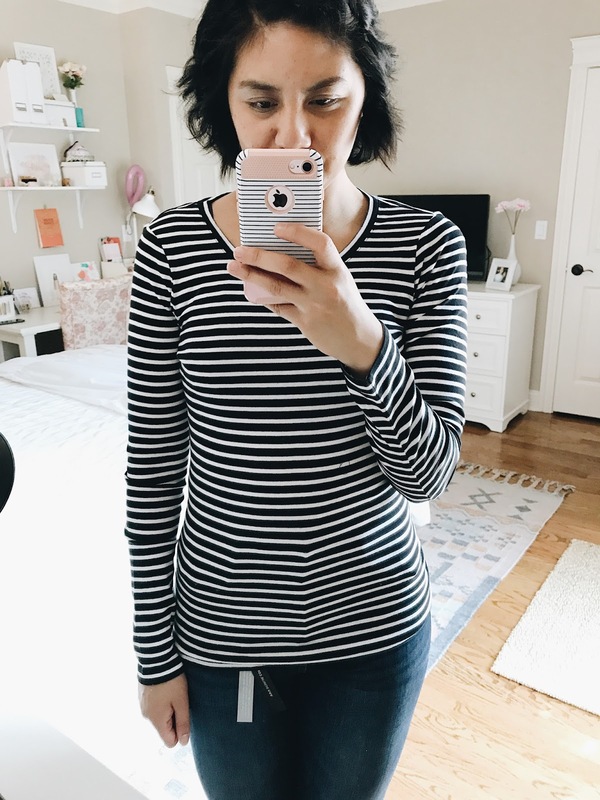 Love that you stocked up on striped tees; I have a huge soft spot for them! So so cute! 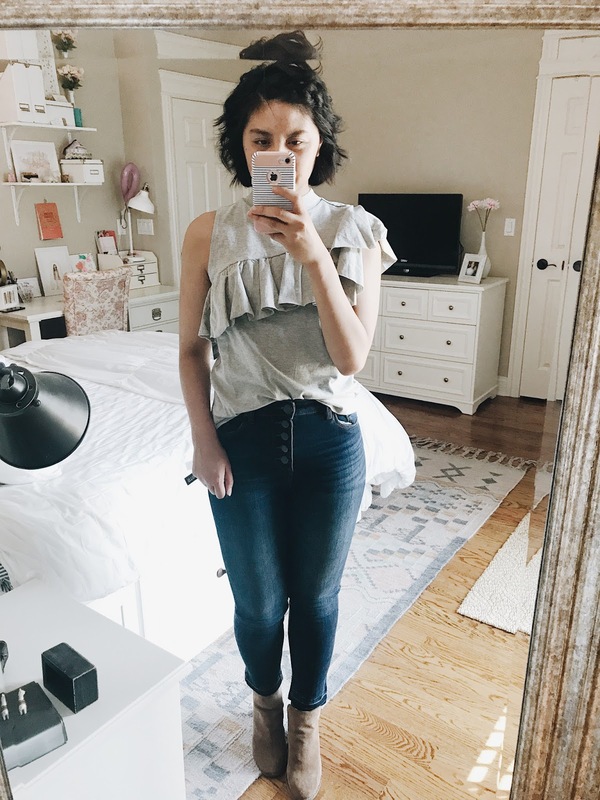 Loving the ruffles top and high waisted jeans! Awesome picks girl! so many cute pics, I love the red ajcket of course! 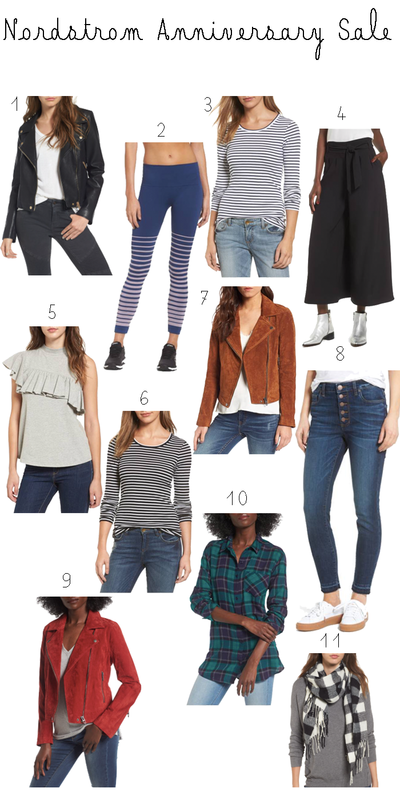 I love all of your new buys – particularly the jacket and the asymmetrical tee! Great post! Love all your new buys! Oh, I love your picks. I would get the red leather jacket as well. I like your Suede Moto Jacket. It's really cute but rugged at the same time. Also, couldnt agree more on you re. the scarf. Fall is indeed a scarf season. Thank you Jessica! Right?! 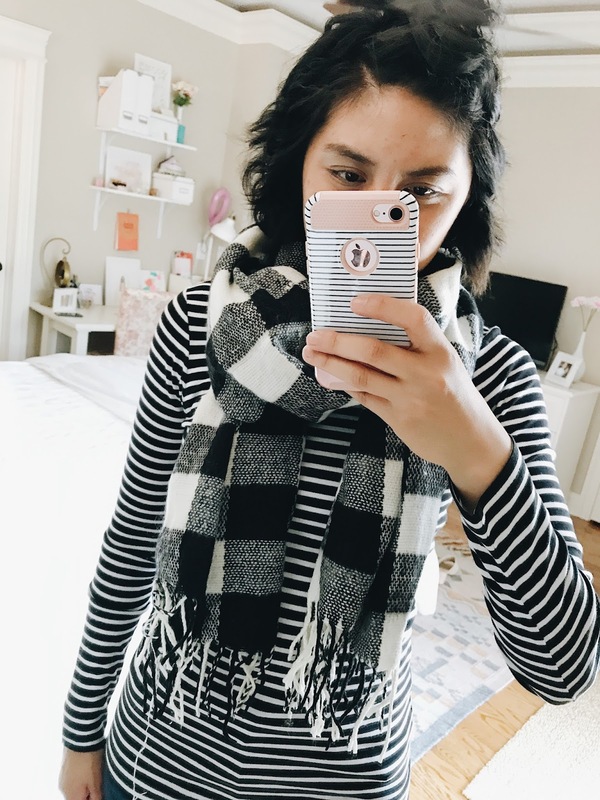 Scarves are the best in the fall! You killed it with your shopping at the sale!!! Seriously, sale shopping goals. Thanks for sharing! Thank you so much! I have been saving my money for it! No way I could spend this much all the time haha! I'm loving all your picks, babe- you snagged some killer pieces! 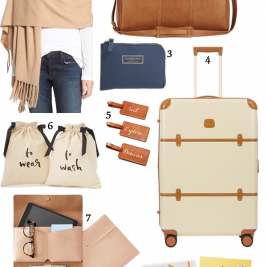 I love that you purchased so many items that can easily be mixed and matched – and you showed that here! Such ingenuity! 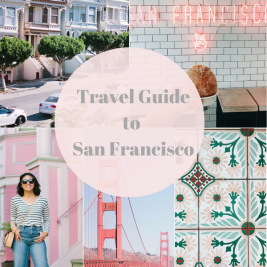 I can't wait to see these pieces styled for the blog in new ways as well! I am all about getting my money's worth haha! Thanks Stephanie, I can't wait to style them! Love the moto jacket! Cute! You got soo many cute pieces from the sale and all so perfect for fall! I was eyeing that red suede jacket as soon as you posted it on Insta! I can't believe the sale is almost over already! I love the wide leg pants! 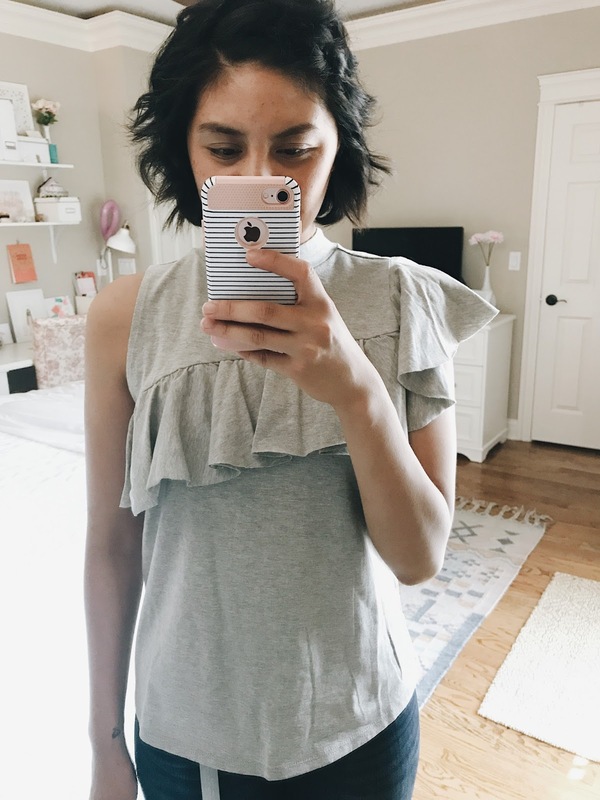 I love that top with the ruffles! Sososo cute!!! SO many cute things! Loving all of the stripes and plaid and really want that moto jacket too! How cute are those high-waisted black pants, such a great find! 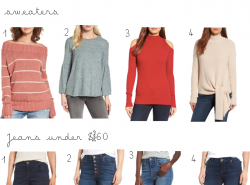 How did I miss that ruffle tee during the sale? So cute!